Posted by Alicia Jaimes on December 3, 2018 in Lifestyles. Since her freshman year, Ferris political science junior Charnice LaGrone has felt connected to You Beautiful Black Woman (YBBW). Drawn to YBBW by the empowering name and welcoming members, LaGrone has grown from general member to community service chair, saying the registered student organization (RSO) has helped her transition from high school to college over her three years at Ferris. Along with making the community feel welcome, YBBW members feel just as welcome since joining this RSO and consider it a very friendly and supportive organization. “Even though we have a business aspect and we work and it’s a lot of hard work because we are a small organization that put on a lot of events, but we also have fun, and we go out, we’re normal people,” Ferris business administration senior and YBBW assistant to the president and vice president Aalona Jackson said. As well as an organization that considers its members more like sisters, YBBW strongly believes in volunteering and hosts events frequently throughout the semester, including this year with a twist. “We host social events, and this semester we implemented like, more so educational events, like bringing awareness to certain topics,” Ferris mortuary science senior and YBBW member Larrionna Umphryes said. 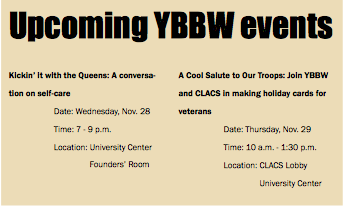 As part of their new speaker series “Kickin’ it with the Queens,” YBBW members are hosting a conversation on self-care from 7 p.m. to 9 p.m. Wednesday, Nov. 28, in the University Center Founders’ Room. This event will address the importance of self-hygiene and how to manage it in a financially-friendly way. Believing in the importance of networking, many YBBW events are collaborated with organizations like Office of Multicultural Student Services (OMSS), Center for Leadership, Activities and Career Services (CLACS). Ferris OMSS pre-college programs coordinator and YBBW Adviser Danyelle Gregory is proud of how far this RSO has come since first becoming their adviser in 2015. Referred to by many members as “Mom J,” Gregory is honored to be their adviser. “These young women are full of potential and I believe they will go on to do amazing things and continue to embody what YBBW stands for: ‘Queens by Nature,’” Gregory said. To join YBBW, students can contact any members. From here, they will be included in an email this spring for new potential recruits. Though any student is welcome to join, be prepared to get out of your comfort zone, network and find a group of sisters. Students can visit the YBBW page on orgsync or email them at ybbwferris@nullgmail.com.